It was one of those spontaneously planned holidays. I had heard Konkan scenic rail route was a must-do in many a bucket list, so I picked the train. Hopping on, with last minute tickets booked the previous morning, we set out to Gokarna, the town of beaches and temples. We opted to rent a bike and trust Google maps to explore the town (I must tell you we weren’t disappointed). Some of the beaches are easily accessible by road while others are reachable only by boat or trek. 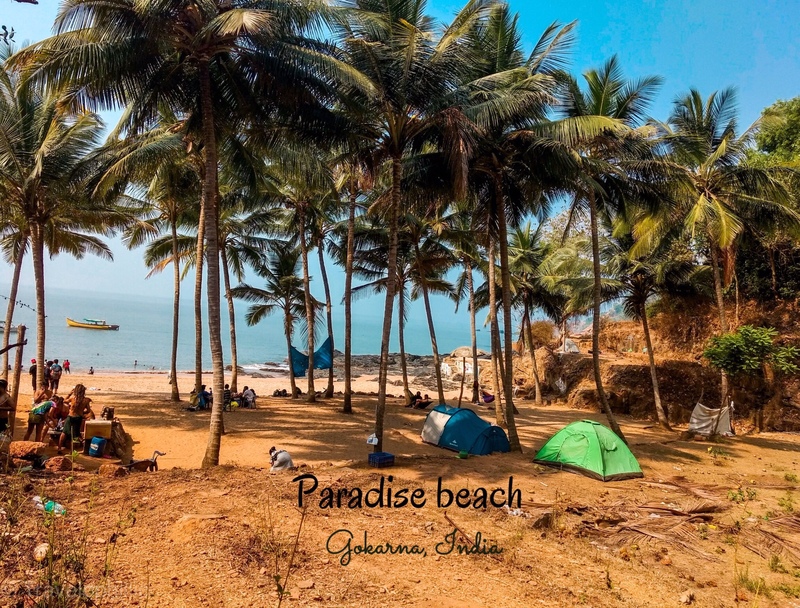 All guides on the internet highlight the trek from Om beach to Paradise beach via Half-Moon beach which is a long and treacherous route that can get slippery during rainy seasons making it impossible to cross-over. Even if you do make it, it can leave you really drained by the time you reach Paradise beach, which now happens to have no shacks or restaurants. I learnt from a local that it’s apparently illegal for vendors to sell any food or drinks here, so if you do happen to encounter a vendor who sneaked in, be ready to empty your pockets. You’ll need to carry your own food and water. The climb between Half-moon and Paradise beach is the most treacherous one, which can be bypassed if you take the shorter and easier trek route starting from Belekan Beach. Nonetheless, even if you choose to continue to trek to Half-Moon beach from here you still save the distance between Om and Half-Moon beach. The easiest way to get to Paradise beach is a boat ride from Om beach but I don’t recommend it as the boat usually won’t stop here for more than 15 mins. Moreover, the place feels a lot more sweeter after you break a sweat to get here. I couldn’t find any pictures or guide of this trek online which would’ve come in handy had I come across one before I started my trek. I’m hoping this helps anyone who intends to go for this trek. The trek is easy and takes between 30-40 mins to get to Paradise beach. Small hell beach is a very small beach just beside Paradise. Trekking from Small hell to Half-Moon involves crossing the Hell Cliff which is moderate-difficult level trek depending on the weather (Not recommended during rains). Once you get here, you have restaurants and shacks to satiate your thirst and appetite. You’ll see the beach after 20 mins. You need to make a descent from here onwards. Trekking further from Small Hell beach to Half Moon beach..
Half moon beach at last! You could either end your trek here and get to Paradise beach/Om beach by a boat or you could trek further to Om beach. You may have to wait here for a while for boat rides since most boats come here with passengers who’ve pre-booked a return trip. We found a boat ride for Rs 200 per head from Half moon back to Paradise. Have you been to the Paradise beach yet? I’d love to hear about your experiences and thoughts in the comment section below. Being an avid trekker, I would choose the trek over a boat ride. I have heard a lot about this “beach trek”. Someday…. That’s amazing, you should definitely try this one! Thank you so much arv! There’s a lot more than Bangalore in Karnataka. The more you get to know the more you’ll be tempted to explore! Been to Goa twice and Gokarna is still on my To Visit list, but the craving has fuelled further after reading your blog. Beautifully pieced together and the pics are a treat for the eye 😊. another fun memory reactivated…loved visiting this place after final exams of long ago…her pictures are great…. great pictures….well written… you are bringing back memories of one of my favorite spontaneous train journeys…thank you!